Welcome to the other half of Our Hiking Blog, Sue, as she reflects on three recent trips that ranged from luxury to a bit tough and cold. Toward the end of last year I felt the need to go wandering somewhere wild and after a chance meeting with an old friend the idea to do the Overland Track (again) was born. This wander was timetabled for the March school holidays. 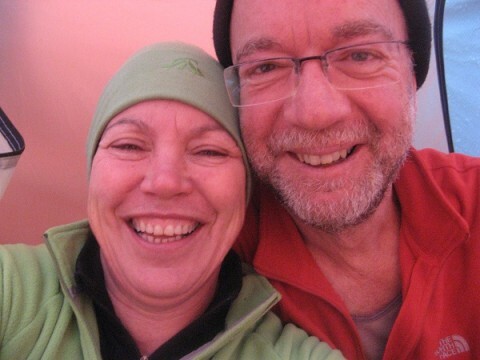 My friend Deb decided to join us, a great way to celebrate successful treatment for breast cancer. 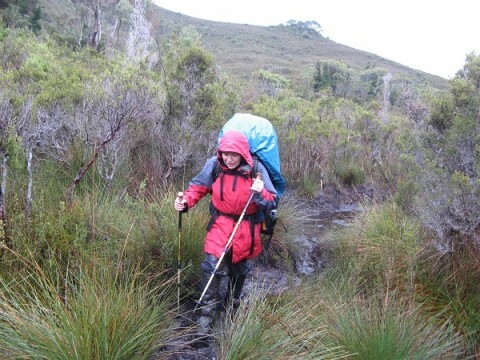 Following a conversation with Mark (South Coast Track – 2009), who it turned out has done almost every walk in Tassie with the exception of the OT, he decided to tag along as well. This proved to be a wonderful walk. Deb found the going so much easier than the first time, she revelled in trying recipes from Food to Go and impressed all with her culinary skills. Anne marvelled at the scenery, the grandeur of vistas along the track is always awe inspiring and Mark, who is such a good walking companion, and took far too much of everything, just enjoyed being out there. We had, as people said at the time, the best week of weather for the season – true Aussie autumn, sunny clear days with morning frosts,frozen puddles, chilly evenings and nights. As planned, we spent a night at each hut and so the trip took us 6 days. I find the huts a little claustrophobic so decided to tent it each night. What a joy, snuggling in my wonderfully warm sleeping bag and waking in the morning just as the day is beginning. The only hitch was the very early morning riser at Bert Nicholls Hut who decided to boil water and then have a wash even before the sun was up. One of the joys of being “out there” is meeting and talking to people. In the real world we do not often have or take the opportunity to meet and talk to others. Yet “out there” we all have something in common and this becomes the basis for conversation, whether it’s gear, food, the motivation to be there or the high and low points of the days. To Jenny and Jaye and their family, to “spare” Mark and to all the others who let us be part of their experience, thank you. An essential part of each walk is après walking – that is taking the time to debrief over a lovely meal and a glass or two. Anne, Deb, Mark and I enjoyed this in Hobart at the Shipwright Arms Hotel, Battery Point. Frank and I had decided that we would have Easter on Bruny Island. What a wonderful decision that turned out to be. We had great accommodation, where able to enjoy fantastic food and wine and went for a couple of lovely long walks. Yes, more walking. Back in Hobart for our flight home, we had just enough time to catch up with a friend we had met several years ago at Wild Dog Creek just outside the WoJ. As, always with Grant conversation comes easily and somewhere is this conversation; he offered to accompany us into Lake Oberon in July. A month or so later we began communicating to make some definite plans. Holidays and flights were booked and I began trawling the net for information and found nothing to make me feel good about a wander at this time of the year. This place gets serious weather and the amount of day light was also going to be a challenge. We took the opportunity to get some new gear – Exped Synmat 7 ul sleeping mats and Themolite sleeping bag liners. The weather for the 3 weeks prior to us leaving had been very untypical for this time of the year – lovely cool sunny days, little rain and mild evenings, part of me knew this couldn’t last and it didn’t. We arrived in Hobart at 8:00am and had plenty of time to do some last minute shopping have brekky at Jackman and McRoss and go to MONA. It was well worth a visit and hopefully will encourage lots of conversation about what art is and what is art. The day was gloomy with intermittent drizzly rain. This did nothing to make me feel positive about tomorrow’s excursion. Even, several glasses of red failed to lift my spirits. Monday 4th July we were up, breakfasted, dressed and waiting for Grant, who arrived at the appointed time and from there adventure began. A pleasant drive to Scott’s Peak car park was interrupted for a coffee and delicious scones at the Platypus coffee shop at Westerway. . Our first view of “The Arthurs” was stunning. This line of jugged peaks rises out to of the plains and cuts the sky, like the teeth of some long dead ancient creature. It has not only a majestic presence but also has a sense of malevolence and foreboding. We redressed in the car park and set off – Frank and I were lulled in a false sense of “comfortable walking” as the first several kilometres are very easy – through cool temperate rainforest and then onto very what looks like groomed track followed by board walk. It wasn’t until after we stopped for lunch that the mud began to appear. Our first camp site was at Junction Creek, which we crossed easily. It began to rain just as we put up our tents and so dinner was a hurried affair, although accompanied by a glass of red (thanks Grant). 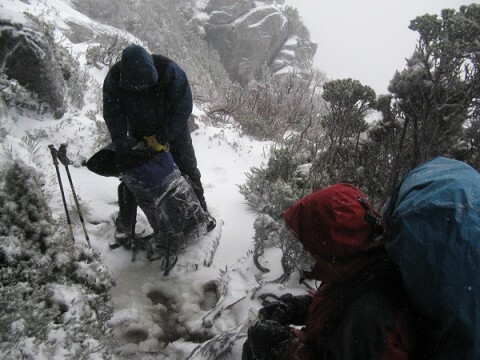 We tried to get up and away early the next day but our progress was a little hampered by rain. As we came out of the trees the weather hit us – wind and hail. At times I felt as if my face was being sand blasted and standing upright was difficult. The climb up Moraine A, although long and at times challenging for someone with short legs wasn’t too bad, we were offered a little protection from the weather. Grant, who was becoming concerned about our progress carried my pack for me over some of the steeper sections. At the top of Moraine A we had a quick snack before venturing onto the top of the range. As we rounded the corner the full force of weather hit. Freezing winds that where so strong made it hard to take three consecutive steps without being blown of the track. The amount of ice on the track also made it difficult not to slip. Fortunately, we had good visibility and after passing Mount Hesperus, we were able to see Lake Fortuna on our right. Grant told us that in the past others had ventured down to Lake Fortuna to escape bad weather but that the track isn’t easy. Clearing the saddle west of Mt Hesperus leads to a gentle climb up and onto the Capella Crags which is a slightly high section of plateau and rocky outcrops. Once we had climbed out of the lower saddle there is a small pass on the Capella Crags that we traversed before dropping into Lake Cygnus. Snow had covered most of the track down to Lake Cygnus and I’m not sure if it made it harder or easier but it was, certainly good to be out of the wind. Arriving at one of the tent platforms, we cleared about 10cm of snow and very quickly put up our tents, got some dinner and where snuggled up in our sleeping bags by about 5:00pm. Grant suggested that given the weather, and the likely condition of the track, we should abandon our plans to continue onto Lake Oberon, have a day a Lake Cygnus and leave on Thursday. So we spend all Wednesday in the tents, only venturing out when absolutely necessary. On reflection Frank and I have discussed what we did that day, how is it that we weren’t bored. We chatted with each other and Grant and dozed, read and used the time to reflect and think. What a luxury to have unhurried conversations, to truly clear one’s mind, to be unable to do anything. This opportunity never presents itself in the real world. Following a wild and windy night, I awoke on Thursday to find my pack, which was in the fly of the tent covered with snow. We had breakfast and packed as fast as possible, boiling some water to unfreeze the straps on my pack. A slow steady climb through deep snow took us out of Lake Cygnus up onto the range. Visibility was very poor and as a result we took a slight detour. Fortunately, Frank’s GPS had marked our track in on Tuesday and we were able to find our way back onto the track. Back at the top of Moraine A we were unable to find the marked track down as it was covered in snow. We simply slid, very slowly on the snow until we were able to find a track maker. It was after dark when Frank and I arrived at the camp site at the base of Moraine A. It had been a long day from sunrise until after sunset. A cuppa soup and ham, cheese toasted wrap proved a yummy dinner followed by a coffee and Cherry Ripe. It’s so good to indulge in chocolate when it’s deserved. The rain and wind continued throughout the night. When we woke in the morning the camp site was a mud puddle. 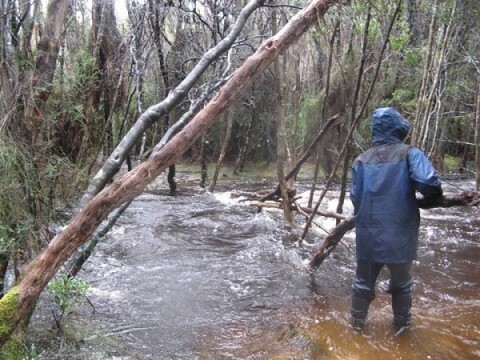 We, again packed quickly and set off to face the next obstacle – Junction Creek – which we had crossed easily only 2 days ago but was now a swift flowing stream which had risen about 1.5 metres. We were all concerned it would only continue to rise and so made the decision to cross. After, a couple of heart stopping moments, we got to the other side, thoroughly drenched. After a quick change into some drier clothes we continued. Due to the amount of rain and snow melt there was now a significant amount of mud to wade through or detour around. Small creeks were now streams that needed to be waded through or climbed over. I am a great one for falling down, slipping of or tripping over and this became the pattern for the day. As fatigue set in it become harder to stay upright but I did and as the sun set we made it back to the car park. It had been drizzling all day but as we changed into the last lot of dry clothes large drops fell from the sky. We quickly got into the car, Grant flicked the heater on high, and this immediately streamed up all the windows and drove back to Hobart. The only stop was for some chips at the National Park Hotel. Some would say silly, others stupid. By the time we has started walking there were 6 weather warnings, this was increased to 8 the following day. We were oblivious to these but we knew the weather was bad. We had appropriate gear, a 1:25,000 map, 2 GPS’s and and PLB. I never felt unsafe but I did have a sense of fear and nervousness. I think this is healthy. Would I do it again at this time of the year knowing what I know now? Probably not, but I do know I really want to go back there and will at a more suitable time. January to March seem to be the best times…………. Those adventures are great fun to look back on (once you recover). We are still chatting and laughing about some of the happenings on the OT – even Alyce reminisces fondly about our trip now and is considering doing the Main Range walk in January!!!! Will wait and see. The kids were delighted to read your blog and that you mentioned them, they really did enjoy meeting up with you guys and sharing some time together. We were very envious of your breakkie at Jackman & McRoss. As Daniel said as he was tucking in “Best Breakfast Ever!’. 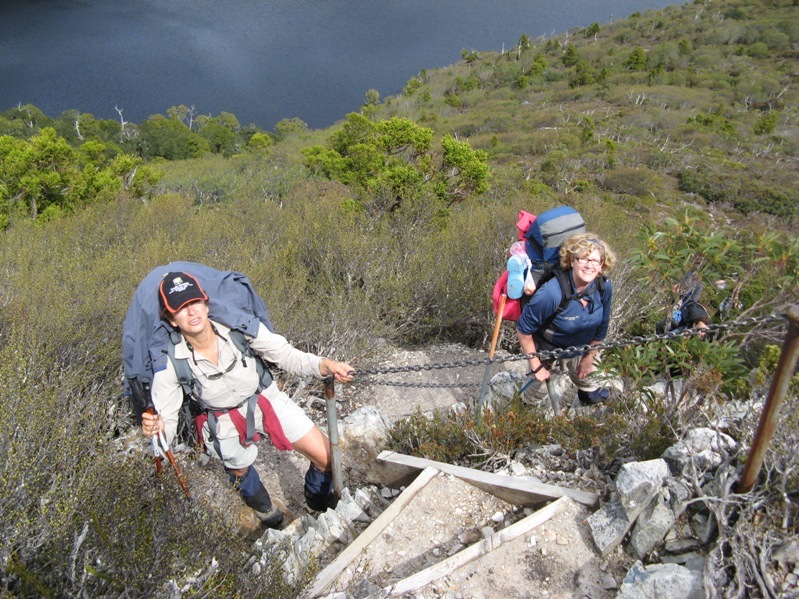 Rachel has gone on Duke of Ed to Belangalo State Forest (a bit scary!!). The weather has been atrocious in Sydney with record rainfall but it has eased since they left. Give our love to Anne, Deb & Mark. Can’t wait to read the next adventure. Thanks for the lovely comments. I think we are more mad than brave. Anyway, we survived. I still have tingling fingers (frostnip) and a sore rib (from a fall) but these will recover in time. I am hoping to go back to The Westerm Authurs next March/April and would like to try and get to Lake Oberon, again. We’ve asked Mark to come and Debs partner, Colin. All is good, back at work and planning our next adventure, Cambodia (Angkor Wat) in Sept for 10 days. PS Let us know if you’re interested in TWAs. I think I got some good points out of your extreme weather experience. 1. Make sure you have the right gear. GPS maps and a tent that will handle almost any weather. 2. Be prepared to turn back or change plans if the weather changes. 3. If the weather gets serious be prepared to stay in camp for a day or two or until the weather changes or you are rested enough to try again. 4. 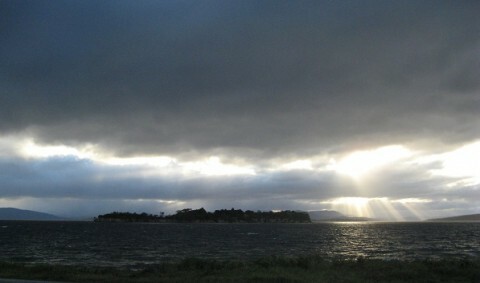 Watch the weather forecasts but even if the weather looks ok Tasmanian weather can change very quickly. Be prepared for the worst. 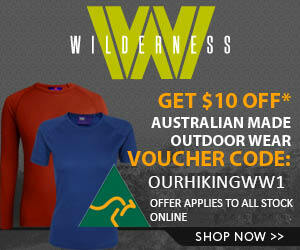 Can you think of anything else that may be helpful to new bushwalkers. We are working up to a full article of “What we did wrong” or “lesson’s learned” that relate to this trip. Just thinking about them for a while so we don’t miss any! Great I will be looking forward to that. I prefer to learn the easy way rather than the hard way. Sorry for waking you up at BNH! Although I think maybe it was your bladder that called. Well done Mark, she forgot to mention that bit……..
Meant to warn you of the mention, pleased you caught up with article. No Mark, I am pretty sure it was your activities that woke me not the bladder. It was then very difficult to go back to sleep then with all that swishing water. LOL! Ok, maybe true, but I’d only just got coated in warm soapy water and there were you shining your headtorch around like an electrified prairie dog. Bit embarrassed! I had to try to shine my headtorch in your eyes to maintain my dignity, such as it was. Hilarious! 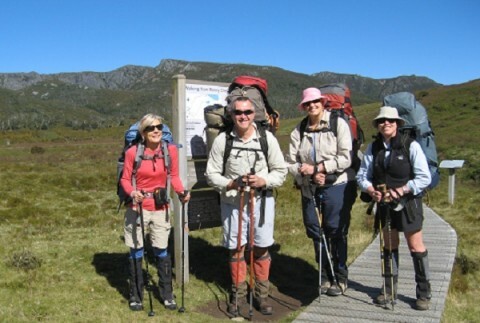 Keep up the blog anyway guys, and good luck with the Western Arthurs walk.